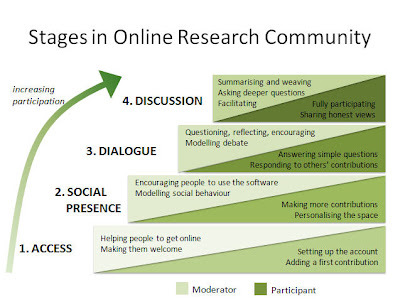 This is a model of research community socialisation that I developed in a white paper for Virtual Surveys a couple of years ago. I was inspired by two sources: first, the ‘forming, storming, norming, performing’ model of focus group dynamics that all qualitative researchers have drilled into them; and a similar five-step model developed by Gilly Salmon to account for online socialisation in online learning environments. Most of the chat about community moderation skills focuses on the higher level issues of discussion and debate. What I wanted to stress in this model was the importance of the two bottom steps, access (getting in) and social presence (establishing your voice). Access is probably the most-neglected element of all. We might invite people. We might screen them to find certain characteristics. Whatever we do, participants do not arrive at an online discussion relaxed, chipper and ready to go. Like the focus group attendee who’s late for a group, they’ve just been on a journey. It probably involved an invitation and a link; then it may have involved some registration and some screening; then it may have required that they set up a profile.